Udate – 9-16-13. A lot has changed about content since I first wrote this article a couple of years ago. For one, content is no longer a step sister at the ball, it’s the Queen. On the other hand it is sometimes the evil Queen if you’re a consumer trying to find relevant, trustworthy data. So many companies today create content for companies for the purpose of SEO it’s difficult to tell what’s a real informational piece from one that’s been commissioned. Not that a commissioned article can’t be chock full of good information, it can. It’s just pretty hard for the average consumer to tell. That said, the rest of the article still stands on it’s own. 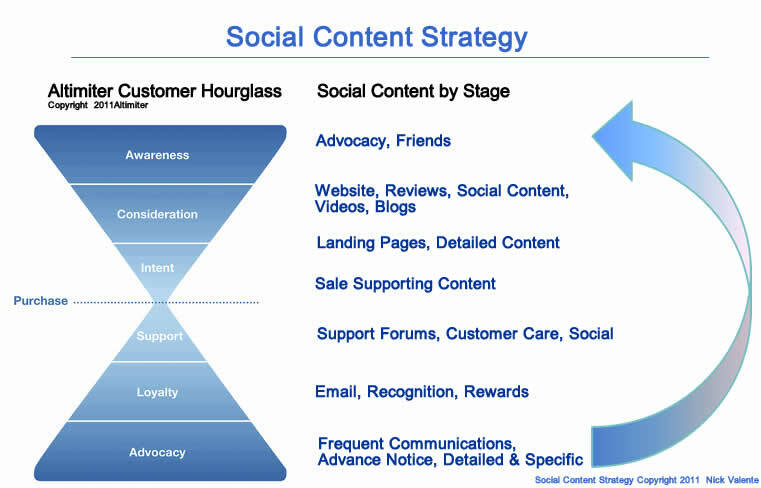 In a recent post Altimeter, the social media strategy folks, posted a great graphic on the Social Media Hour Glass. It documents the buying cycle through social media interaction. Being a firm believer in the role of content in social media, I took Altimeters’ hourglass and mapped out what content would look like against the Social Media Hourglass. This model only looks at the role of content while fully aware of the place all the other on and off-line marketing has on happy customer and a sale. Awareness– Advocacy & friends can play a big part in creating awareness of your products and services. For large companies with a monstrous base, advocacy plays an important part in managing social media, but it also plays a part in companies of all size. Consideration – Once aware, you relay on your website, customer reviews, social content, blogs, and other content to further more a customer toward your product. The most interested customers will want as much detail as they can get, so landing pages, videos and other more detailed content becomes more important. Intent – Once close to a decision, customers need supporting information on purchase specifics; when will my product arrive, is shipping really free, will your support team be available 24/7, what are your terms? Support – After the purchase your support content needs to be consistent with pre-purchase and be available across multiple platforms. Loyalty – Building loyalty through email, rewards programs, recognition requires content geared toward the budding Advocate. In the end your advocates support your awareness and the cycle starts all over again. What is your social content strategy? Next story Link Bait Headlines, Do They Work?